EXTENDED BY POPULAR DEMAND ! There is nothing like autumn! It's going to be massive! New concept, new table, beauty all around! 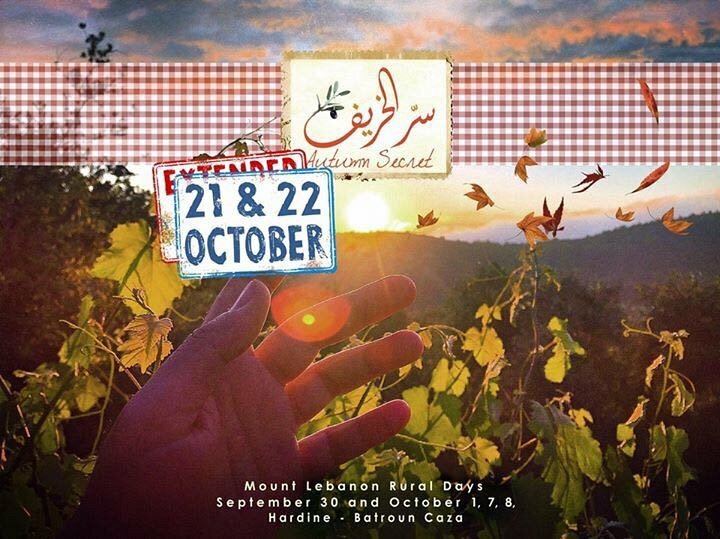 This is the magic that awaits you in Hardine - Batroun Caza, for our "SERR EL KHARIF - AUTUMN SECRET" Rural Days, second edition. Picture this: A breathtaking scenery, a discovery of the first Lebanese Christian village with its more than 36 churches (some of as old as a thousand years), renowned religious and historical landmarks including Saint Neemtallah El Kassab's house and the famous 300 meter-long rock slab, and to top it all a mouthwatering terroir food lunch freshly picked from earth and seasoned with an innovative twist to carry you through the magic of fall in our beloved Lebanese mountains, a glass of Arak in hand... peace, poetry and farniente all around! Price: 45,000 L.L. for adults, and 35,000 L.L. for children under 10, Free for children under 4. Including: Village promenade, welcome drink, Lebanese terroir lunch buffet with a twist, saj station, live cooking main course station, desserts, fruits, open Arak baladi and juices, and suprises! Our event follows ecotourism characteristics by relying on local produce and ingredients from the Batroun area, Hardin and Tannourine. By doing that, we are only involving the local community that includes farmers and women from the villages in a gesture to contribute to rural development and preservation of the picturesque life of our mountains. Please note that it's an ECO-FRIENDLY event, so we'll have bins for proper disposals! PLACES ARE LIMITED! So hurry up and make your reservation! This is event is done by Bruno Tabbal and friends!